Seems like we went from 50 degrees and jackets to 80 degrees and shorts overnight. No matter, it was a welcome relief so off to Chanticleer Gardens we went with cameras in hand. 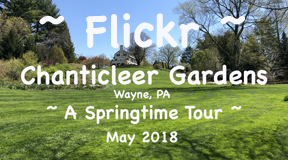 Chanticleer is in Wayne PA in suburban Philadelphia just a 1-1/4 hour drive from home. Pretty easy to get to. Our prime mission was to simply get outside for a few hours and take some pictures. In a few short weeks, we’ll be headed to Europe so we also wanted to test drive capturing images WITHOUT our interchangeable lens cameras. In my case that would be an iPhone X, a GoPro, and a 360 camera. It was only iPhone X for Kathy. Both of us had iPhones mounted into a grip for easier handling. The first issue we ran into was simply being able to see what was on our iPhone screens. The bright sun and reflections made it almost impossible to see controls. I was using FILMic Pro for video and a camera control app for stills. We were barely able to simply compose an image. Half hour in, we found a shady spot to check results and were surprised at how well exposed our images were. Sharpness, for the most part, was spot on.